Today, our cofounders/mother-daughter team, Jody Daitchman & Chelsea Laliberte are heading to Springfield, IL to testify for HB1466 AKA “Lali’s Law” which expands Narcan access to pharmacies! Any layperson 18+ can walk into a pharmacy to get training and equipped in this lifesaving drug. Imagine how many people today alone will stand in line at a local CVS or Walgreens to fill their opioid script. With this bill’s passage, imagine how many more could get the OD antidote along with their meds. 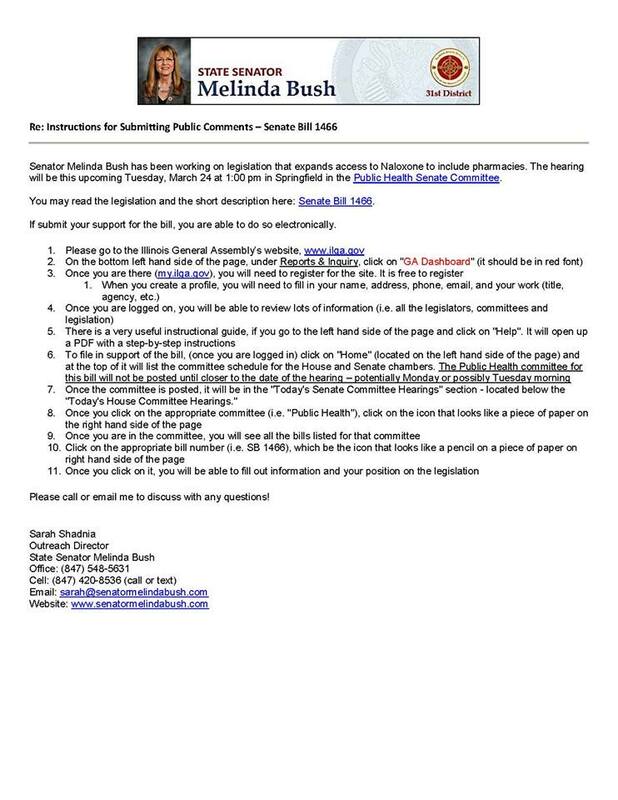 PLEASE SHOW YOUR SUPPORT and submit public comments. Instructions are attached. Our Outreach Coordinator, Genevieve Przybylo, came across this gem yesterday at her local neighborhood Walgreens. As you could imagine, we were all happy to finally see the information publicly emphasized regarding hydrocodone’s restriction. For those unfamiliar with what’s happening, hydrocodone is a very powerful narcotic opioid pain relief medication commonly prescribed to anyone who has endured any level of pain. Yes, even people who get scratches and bumps are sometimes prescribed this by their doctor. The number one prescriber of these meds are dentists – ever get a root canal or had your wisdom teeth pulled? Millions do every single day. This drug is extremely addictive which has contributed to the drug dependencies and addictions/substance use disorders of millions, and not to mention the overdose deaths of individuals every 19 minutes in the United States of America. 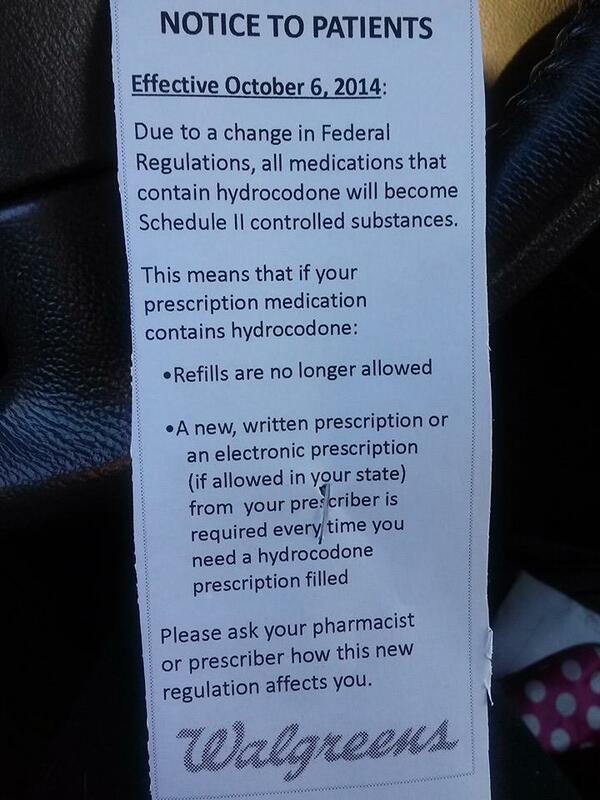 Because of the epidemic, the DEA finally re-classed hydrocodone as Schedule II instead of Schedule III which prevents a consumer from being able to get a refill. While this is a phenomenal step in the right direction, the sociologist in me feels like there is cause for concern here. For those of you familiar with opioid addiction, many people start their journey by orally ingesting or snorting opioid pain medications. Because of the high price of these meds, many users switch to heroin (a Schedule I opioid) which is FAR cheaper (as low as $5 per bag) and FAR more powerful (thus more addictive). My concern is that the unavailability of pain medications will lead people to heroin use, putting those individuals at a much higher risk for an elevated use disorder as well as overdose. If you understand use disorder you know that withdrawal from opioids is extremely powerful and all consuming which would make any human desperate for anything to help relieve them of their pain. My question to the medical community is, what steps are being taken by primary care physicians and other MD’s to properly coach their clients through this process? Is there a referral to treatment process being executed? How are MDs following up with their clients? Or, are they left to defend for themselves without medical care? Regardless of the answers, the ultimate fear I have is that the heroin economy will surge right back up causing more deaths. WARNING: If you have any level of dependency or use disorder to opioid pain medications, please do not try detoxing from this alone or without medical assistance. It is very dangerous. Please reach out today and we can help guide you through this process as well as refer you to an appropriate treatment facility. We are located in Arlington Heights just south of Dundee Road across the street from the Public Storage facility at the "Pediatric Health Care Associates" building. When you arrive to our office, walk around the right side of the building to suite 403B.